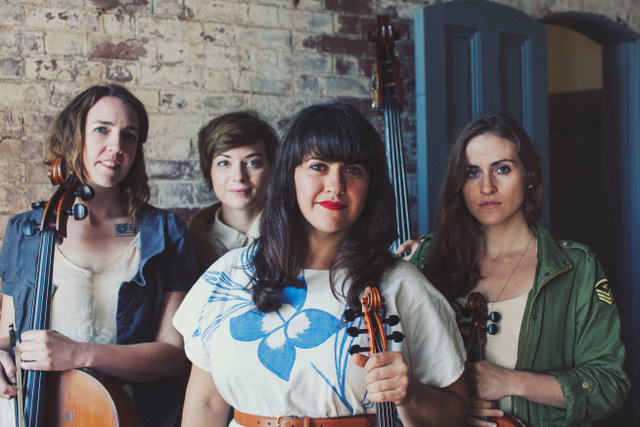 Laura Cortese and the Dance Cards have a vision for their band's sound: bold and elegant, schooled in the lyrical rituals of folk music and backed by grooves that alternately inspire Cajun two-stepping and rock-n-roll hip swagger. Their new album California Calling comes out on October 6th. On their CD release tour, Cellist Valerie Thompson (cello/vox), fiddler Jenna Moynihan (fiddle/vox), and Zoe Guigueno (bass/vox) pair their sophisticated string arrangements and rich vocal harmonies to band leader Laura Cortese's poignant and powerful singing. For their forthcoming album, the band is exploring their special and less common instrumentation with the support of Sam Kassirer, album producer of folk-pop favorites like Lake Street Dive and Joy Kills Sorrow. The new record has a wide emotional and sonic scope. The four voices are just as much instruments as they are providers for lyric and harmony. At times its rowdy, delicate and cinematic. The result is a sound that can start as a string band, and morph into a string quartet, female acappella group, or indie band; all while staying honest and true to their identity as folk instrumentalists. This is post-folk that seriously rocks.